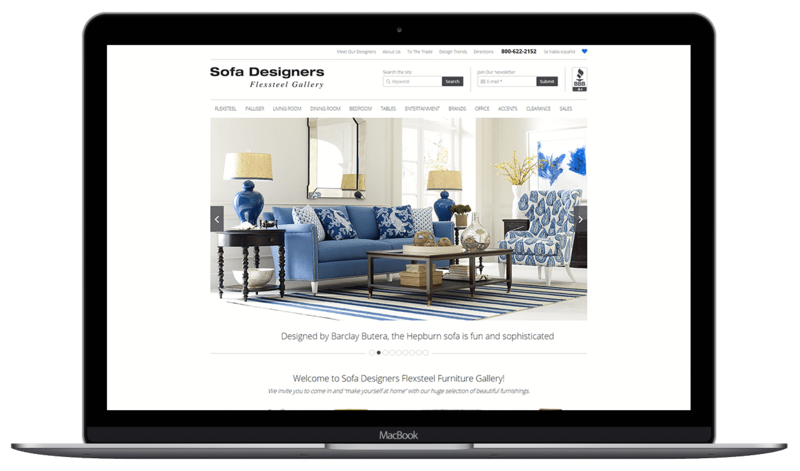 WordPress Website, Sofa Designers - NOYO Web Development Inc.
We contacted NOYO Web Development Inc. to revitalize our online brand and they accomplished everything we wanted. The end result is a beautiful website with a minimal style and large images to tell our story. Sofa Designers doesn’t look like a typical San Diego furniture store. Browse through the homey room vignettes created by our talented designers so you can see just how easy it is to create the space of your dreams using furnishings from such top brands as Flexsteel, Candice Olson, Highland House, Eleanor Rigby, Brownstone, Allan Copley and Orient Express. Sofa Designers doesn’t feel like a typical furniture store in San Diego, either. Each customer is greeted warmly, with a smile, and treated as the special person they are. We are dedicated to your satisfaction and it shows in the way we value every person who walks through the door. As part of that dedication to your satisfaction, it is their store policy to guarantee the seat cushions, frame and suspension of every item they sell for life. This goes beyond any manufacturer warranty; if you are dissatisfied with any piece you purchase from Sofa Designers, they will make it right, all the time, every time and provide this service with a smile.